Salt for the morning; mulch for the afternoon! Wholesale is our name, but we are much more than just that. We are family owned, locally invested, & service oriented. We've been bringing Jackson's best mulch to the market since 1995 - giving homeowners a cost effective alternative to bagged mulch. See our mulch catalog for all your options! 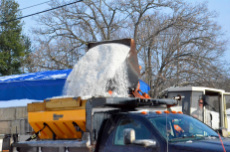 salt solutions you need to keep driveways, walkways, and roofs ice free.